Are You Having an Allergic Reaction to the Flu Vaccine? Flu vaccines are recommended for nearly everyone. They aren't perfect, but they are the best protection we have against influenza, which is a serious illness that kills thousands of people each year. Unfortunately, many people are resistant to getting flu vaccines. Reasoning for declining flu shots vary but may include anything from "they don't work" to being concerned about possible reactions. 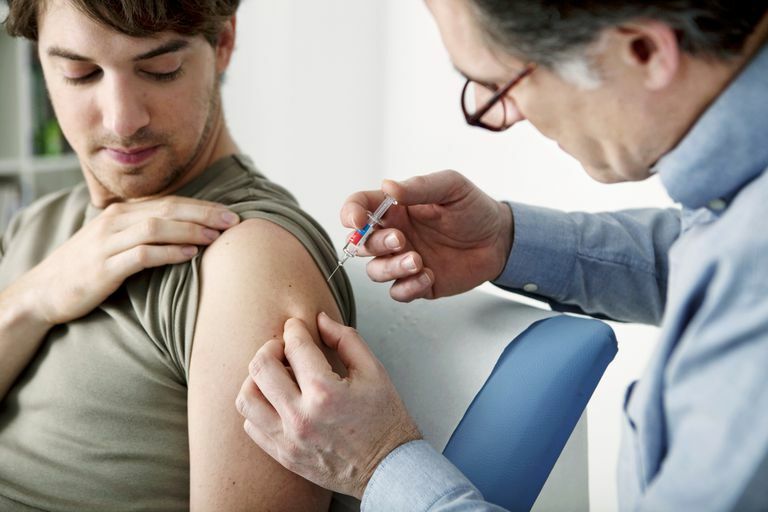 True allergic reactions to flu vaccines are rare, but they can occur. However, it's important to know the difference between a real allergic reaction and a side effect. Some side effects are common with flu vaccines, while others are less so. Side effects don't usually preclude you from getting a flu vaccine in the future while a true allergic reaction does. FluMist, or the nasal spray flu vaccine, is not available in the US for the 2017-2018 flu season due to concerns about its effectiveness. True allergic reactions to flu vaccines—or any vaccines—are extremely rare. An estimated one in one million doses of vaccine causes an allergic reaction. However, because they do happen occasionally, you should know what to watch for. A small rash at the injection site is not considered a severe allergic reaction. Soreness at the injection site or in the muscle where the vaccine was injected is normal and should resolve within a day or two. Some people, however, may experience severe pain in the muscle where the vaccine was injected and have difficulty moving the arm. If this occurs, contact your health care provider. Although it may not be a reason to avoid the vaccine in the future, it is a reaction you should discuss with your doctor. Even if you don't have a true allergy to an ingredient in the flu vaccine, you may experience a reaction that is serious enough to warrant avoiding the vaccine in the future. Guillain-barré syndrome (GBS) is an autoimmune disorder that can sometimes be triggered by the flu vaccine. It is very rare and occurs more often after a respiratory or gastrointestinal illness than it does after a vaccination. GBS typically begins with weakness or tingling in the feet or legs. Weakness and paralysis often extends up the body. In severe cases it may interfere with breathing or other organ functioning. The rate at which it progresses varies, but most people experience the worst symptoms two to three weeks after the onset. A vast majority of people with GBS fully recover but some may experience permanent weakness and it is occasionally fatal. There was a slight increase in the number of cases of GBS among people who received a pandemic flu vaccine in the late 1960s. However, no definitive link has been established to any other flu vaccines since that time. The rate of GBS among vaccinated people and unvaccinated people today is equal. However, due to this possible connection, anyone who has had Guillain-barré syndrome within six weeks of a flu vaccination in the past should not get one again. "Most flu shots and the nasal spray flu vaccine are manufactured using egg-based technology. Because of this, they contain a small amount of egg proteins, such as ovalbumin. However, studies that have examined the use of both the nasal spray vaccine and flu shots in egg-allergic and non-egg-allergic patients indicate that severe allergic reactions in people with egg allergies are unlikely. A recent CDC study found the rate of anaphylaxis after all vaccines is 1.31 per one million vaccine doses given." If you think you are having a severe allergic reaction to a flu vaccine, seek medical attention immediately. If you have questions and aren't sure whether your symptoms could be an allergic reaction, contact your health care provider right away. If you or your doctor believes your symptoms could have been caused by the flu vaccine, you can file a claim with the National Vaccine Injury Compensation Program and report is to the Vaccine Adverse Event Reporting System (VAERS). Either you or your doctor can report a concern about a reaction to a flu vaccine through this system. True allergic reactions to flu vaccines are extremely rare but we share this information so you will know what to watch for. If you have questions or concerns about your own symptoms after a vaccine of any kind, please contact your health care provider to find out what you should do. CDC. Flu Vaccine and People with Egg Allergies. Centers for Disease Control and Prevention. http://www.cdc.gov/flu/protect/vaccine/egg-allergies.htm. Published September 2, 2016. Guillain-Barré Syndrome Fact Sheet. http://www.ninds.nih.gov/disorders/gbs/detail_gbs.htm. National Vaccine Injury Compensation Program. http://www.hrsa.gov/vaccinecompensation/. Vaccine Information Statement | Inactivated Influenza | VIS | CDC. http://www.cdc.gov/vaccines/hcp/vis/vis-statements/flu.html. Could a Flu Patch Mean the End of Flu Shots?